According to a recent AAA Travel survey, nearly 4 in 10 Americans (38 percent) are likely to purchase travel insurance for future international trips. 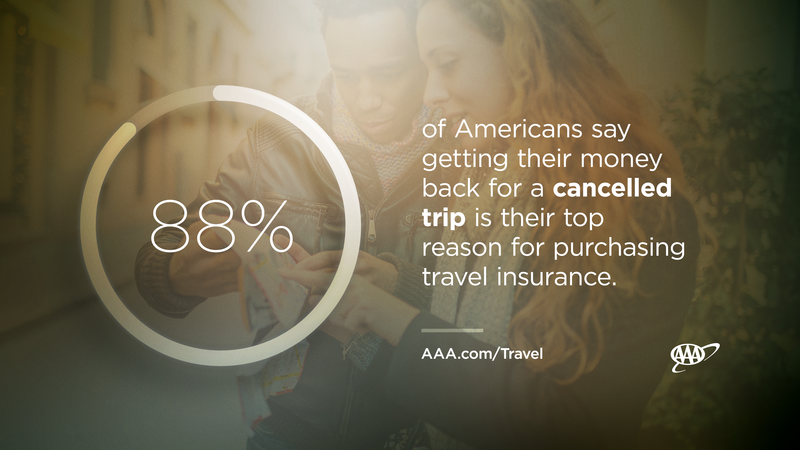 88% of Americans say getting their money back for a cancelled trip is their top reason for purchasing travel insurance. The relatively small upfront cost of travel insurance can pay back dividends in the event of sudden and unforeseen circumstances before or during a vacation. AAA representatives are available to discuss the importance of travel insurance and offer additional travel tips. ContactMark Madejaat (918)935-9318 or mark.madeja@aaaok.org. July 31, 2018– As international travel grows in popularity, Americans are choosing to protect their vacation investments by purchasing travel insurance. According to a recent AAA Travel survey, nearly 4 in 10 Americans (38 percent) are likely to purchase travel insurance for future international trips. For those travelers, trip cancellation protection is the most valuable benefit with 9 in 10 (88 percent) of those likely to purchase insurance saying that getting their money back, if they cancel a trip, is their top priority. In addition to the information collected in the survey, AAA Travel data reflects an increase in demand for travel insurance and members choosing to protect their more expensive vacations. AAA’s domestic and international travel insurance sales have increased more than 20 percent year-to-date, with 13 percent more members overall opting to purchase travel insurance last year compared to 2016. In 2017, AAA members insured trips that were approximately 18 percent more expensive than the previous year, according to AAA’s 30-year travel insurance partner Allianz Global Assistance. “The relatively small upfront cost of travel insurance can pay back dividends in the event of sudden and unforeseen circumstances before or during a vacation. As policies and coverage options vary, travelers should consult a knowledgeable travel agent to explore their travel insurance options,” continued Madeja. You landed, your bags didn’t. Airlines mishandled more than 22 million bags in 2017. Travel insurance can provide coverage to replace needed items if luggage is delayed, damaged or stolen. Sick happens. Insurance may help cover medical expenses while traveling, internationally and in the United States.Many hospitals outside of the country require cash payments before providing treatment.